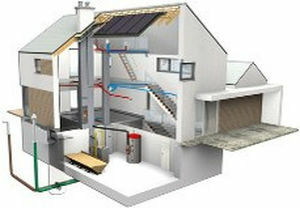 The right ventilation system plays a very important role for air quality and the quality of life. Schiedel offers state-of-the-art natural and mechanical ventilation systems for all types of buildings. Due to energy saving measures, modern buildings are becoming more and more leak-proof and a natural ventilation is not sufficient anymore. Therefore in modern building an easy to operate and cost-efficient ventilation is a must. For multi-family homes, Schiedels ventilation shafts offer a natural draft or hybrid ventilation. Mechanical ventilation is available both for single and multi-family homes. Schiedel also offers effective ventilation systems: The AERA ventilation system improves the air quality in single-family homes. It is able to manage a healthy and demand-driven ventilation in the home not only contributing to health and pleasure but also protecting a home against undesirable mould. AERA EQONIC is a ventilation system with heat recovery for an energy-efficient improvement of air quality. It uses the warm air coming from the interior to warm the inflowing fresh air. Heat recoveries of over 90% save energy and lower the costs for heating. AERA EQONICs heat recovery quota is 93%. This system also reduces harmful C02 emissions and thus helps protecting the environment.